I'm a huge lover of home décor and with Spring just around the corner, I thought I would share my favourite picks to update our home. I'm loving neutral colours at the moment (mainly white, greys and black). This also makes it a lot easier to switch different accessories around for each season without having to spend a fortune re-decorating. I wanted to add a touch of colour and thought yellow would be perfect for the warmer months. 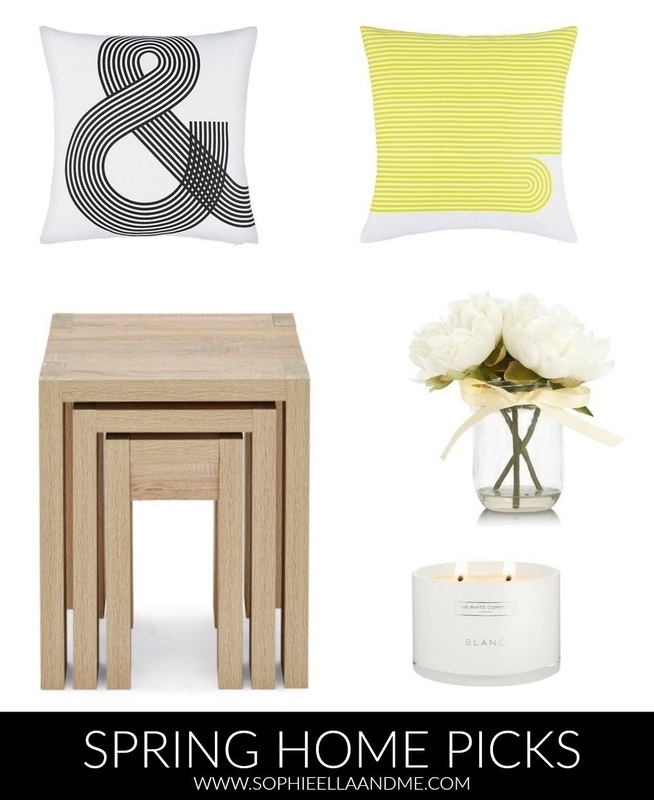 I firstly chose a couple of cushions from John Lewis; the ampersand one and yellow stripe, which both go really well together. They're in the sale at the moment too, which is even better! I've had my eye on this nest of tables for a while now, which is part of the Corsica furniture range from Next. We already have some of this furniture in our living room, but I think these would be perfect when we have friends over. I would also be able to put my new Blanc 3-wick candle from The White Company on top and some flowers, such as these white peonies. Will you be updating your home for Spring? Great picks! I always tend to avoid yellow but I don't know why, pops of yellow would probably lift my mood sometimes! I love the bright colours. They are prefect for spring. I spy cushions. I have a slight love for them at the moment and candles too!! Lovely fresh choices. Can't wait for spring to hit!